Since I started my PhD studies one year ago, I have mainly been focusing on collecting relevant sources on artisan dress in Renaissance Denmark in 1550–1650. The sources I have gathered range from travel accounts, sumptuary laws to religious and moral writings about dress, printed sources, and images that shows the dress of ordinary people and artisans. 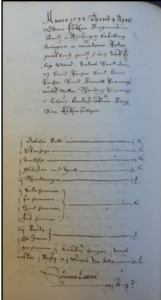 However, most of my time during the first year has been spend in the Danish National Archive, collecting inventories of artisans from the town of Elsinore. Going through 15 handwritten protocols and one published, I have collected over 400 artisan inventories that contains lists of dress.Furthermore, these represents artisan masters, journeymen, artisan wives and widowers and their children. In general, the records give information on the types and styles of dress, colours, accessories and sometimes the condition of clothing. 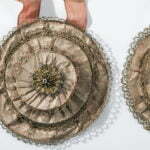 Some of the inventories also give examples on people from the artisanal group who kept fabrics for having clothes made. In 1592, when the Blacksmith Peder’s estate was drawn up, the valuers found wool worth of 1 mk, which was supposed to be made into a kirtle. Furthermore, his estate contained a red woman’s skirt made out of say, an old leather kirtle with five pairs of silver hooks together with a leather jacket. 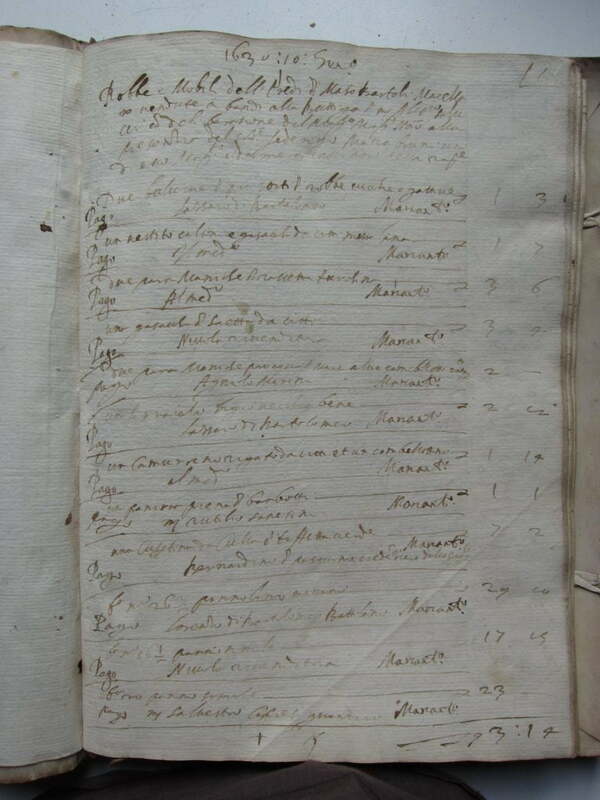 These few examples are only a fraction of the information that the inventories reveal.From January onwards I will be focusing on structuring the information from sources, and this will hopefully uncover lots of exiting things about the clothing culture among artisans in in Early Modern Denmark. How can we use written sources, extant objects, and historical hands-on experimentation, to gain access to the meanings and complexities that lie behind historical objects and documents? 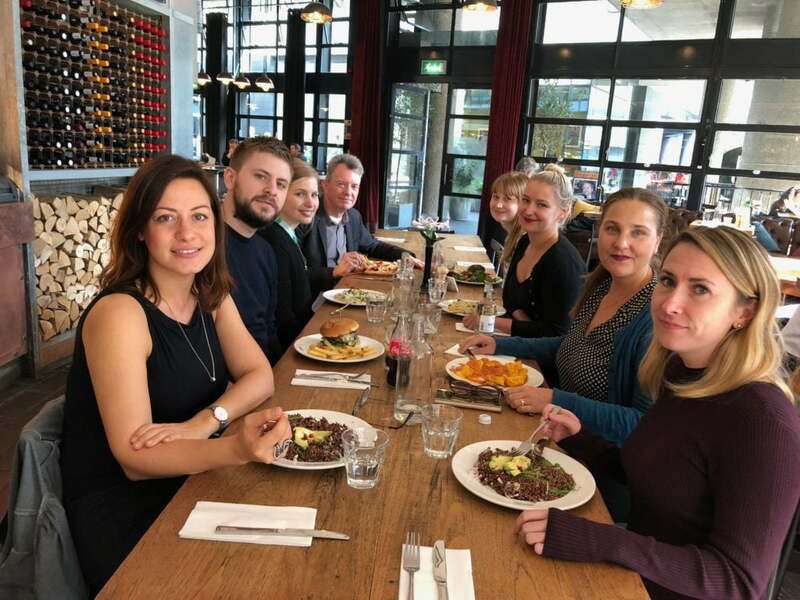 This was one of the main questions that our team discussed at length when we gathered together in London in October for a two-day workshop, organized by our postdoc researcher Michele Robinson. 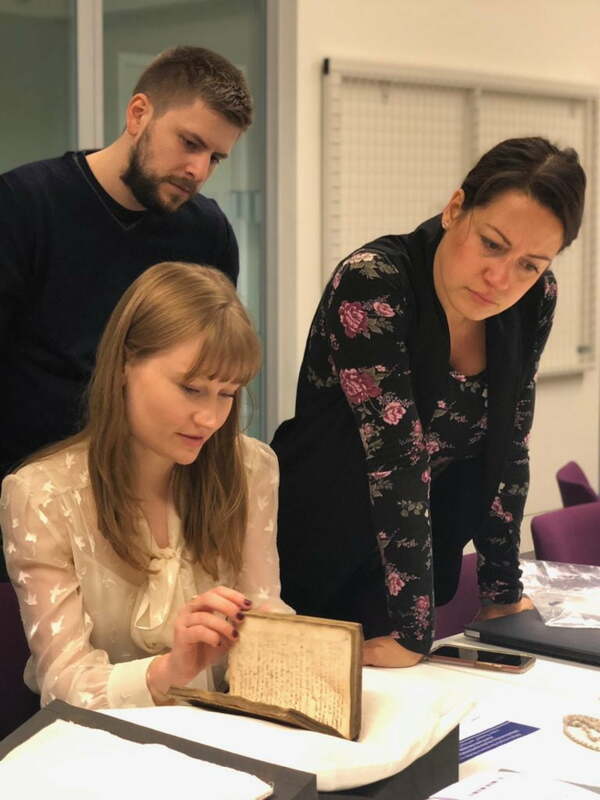 During the two days, we not only looked at our documentary sources, including sixteenth century account books and inventories, discussing how we can best combine quantification with qualitative research. We also thought about how we can connect our documentary data with surviving objects, such as cheap printed recipe books, knitted pullovers and linen undergarments, and use these as a basis for our forthcoming material experimentation and scientific analysis. Therefore, one of the important questions we asked in this session was, what can we actually learn by simply looking at and touching material objects, such as such as sixteenth-century printed advice manuals or a pair of early seventeenth century sailor’s breeches? 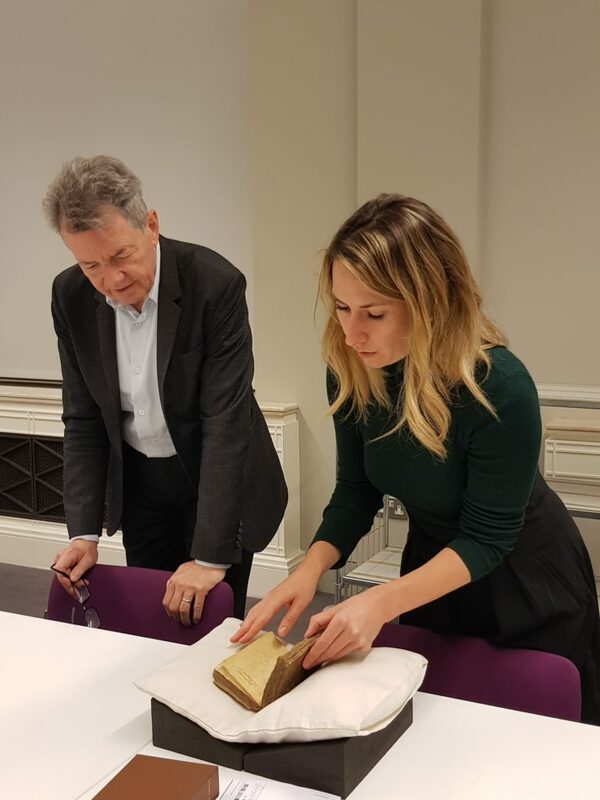 Because we are very interested in cheap early modern printed manuals that provided advice on a range of topics, from how to throw a dinner party to how to dye one’s beard black, the Wellcome Collection in London was a perfect place to start. The Institute holds a notable collection of sixteenth and seventeenth century printed books, including books of secret that contain recipes. One of the books that we studied was Opera nuova nella quale troverai molti bellissimi secreti, a collection of cheap pamphlets from Venice from about 1540s. Although these small leaflets are now bound together as a book, cheap instructive pamphlets were originally sold individually by street peddlers and book sellers at a low price, and these were, as we can see in the picture below, of different size. The low cost and status of such pamphlets meant that such recipes and instructions were, at least in theory, easily available for our artisans and shopkeepers. 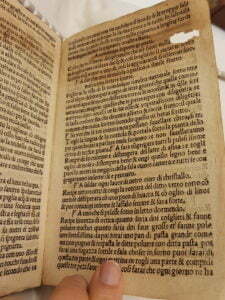 Turning the fragile pages of this simple book revealed small details of tear and wear, and demonstrated that small hand-written inscriptions and notes had been added on the margins of the pages. Although we do not know how books of secret were originally used, this gave a sense that at least some people, at some point in history of these pamphlets, has tested and used these particular recipes. 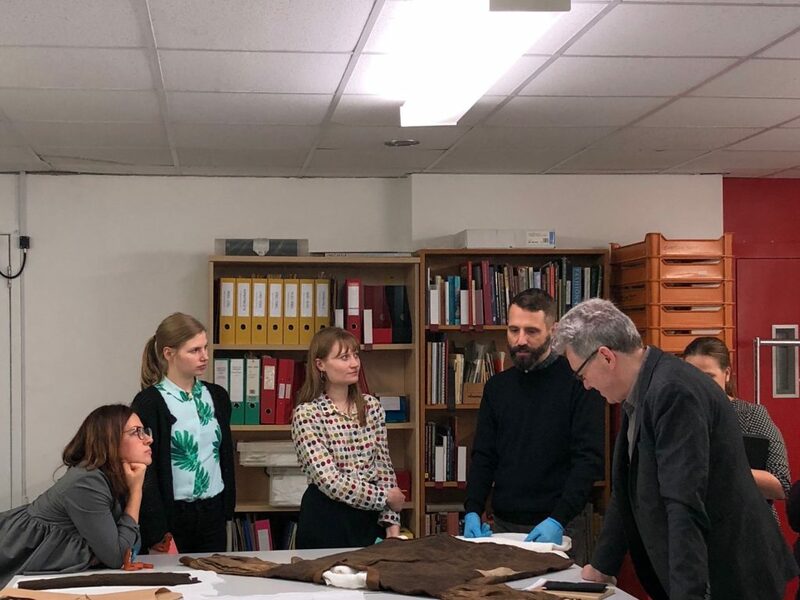 On the second day of our workshop, we had the opportunity to spend an afternoon at the Museum of London storeroom together with the curator Timothy Long, and to engage closely with some extant, less-affluent historical garments from their collections. This allowed us to study in close detail, for example, how a simple sixteenth-century sleeve was constructed, in what way a cap was knitted, lined and fulled, and how a sailor mended his own clothes and marked his breeches with initials or his personal sign. It is sometimes touching to see patched modest garments, and to think about how our artisans and shopkeepers, some of which were relatively poor, may have worn, made and mended these garments, treasured these for their monetary value or beauty, or handed them down as bequests in their wills. Curator Timothy Long presenting some of the early modern textile objects in the Museum of London collection. What made these two days very special was that Professor John Styles, who is a member of our advisory board, joined us for the entire two days, and shared his experience and valuable insights about how to combine documentary research with object-based analysis and hands-on experimentation. We were also accompanied, for the first time, by our new postdoc researcher Sophie Pitman. Sophie has been working on historical reconstruction in the Making and Knowing project at Columbia University in New York, and she will lead the experimental part of our team work from January onwards. John Styles and Michele Robinson. Sophie Pitman, Mattia Viale, and Stefania Montemezzo. The two day-workshop was extremely important for our project, because it provided us with some new in-depth insights and inspiration about how we at the Refashioning the Renaissance project can approach documentary sources alongside historical objects, and use them as a basis for material and digital reconstruction and hands-on experiments, which we will start in January 2019. Our deep interest in the analysis and reconstruction of materials, techniques and objects, alongside visual and documentary sources, connects our work with the research tradition developed in several other international research centres and projects, such as the Netherlands-based ERC-funded project ARTECHNE, led by Sven Dupré, the Making and Knowing Project in Columbia, led by Pamela Smith, the Centre for British Art in Yale, led by Amy Meyers, and the Renaissance Skin Project, led by Evelyn Welch, all of which work, in different ways, at the intersection of craft, art and design history, and history. Our intention is to continue our work within this tradition, and to think about how we can further develop this historical approach by connecting historical experimentation with digital reconstruction. This framework, we hope, will allow to establish a set of new methodologies in material culture history studies that allows us to gain better access to the skills, sophistication and hidden meanings that were involved with objects, materials and techniques in this period. After a year, with the last days spent in Siena in late October, the work in the Italian archives is complete. It has been a long and intense, but rewarding work, and it has given us great results. 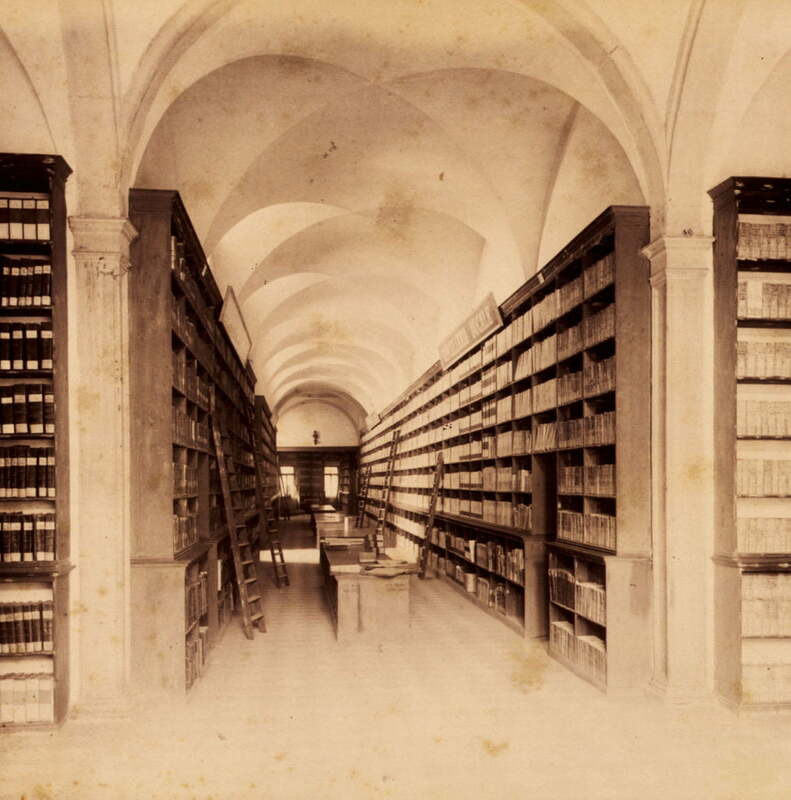 An old picture of the Archivio di Stato di Venezia (copyright MIBAC, Ministero per i beni e le attività culturali). The research work started in October 2017 at the Venice State archive, where it was possible to find a large number of documents. Here different collections were used: notarial and court collections contained post-mortem probate inventories that were requested by family members or appointed tutors in order to estimate the inheritance. In Venice I was able to find more than 600 inventories, of which 450 ca. will be included in the database (we are excluding mercers, goldsmiths and other high rank professions). 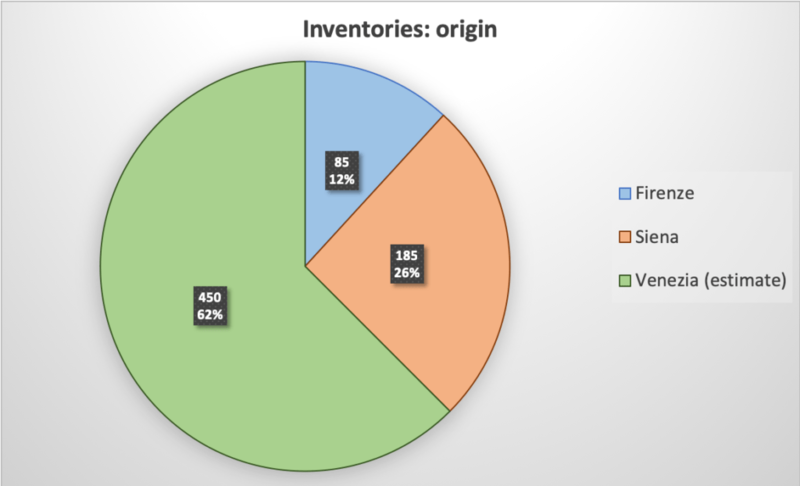 Origin of the inventories in the database. At the beginning of 2018, the research focused on Florence. I spent there 3 months doing research at the archive, particularly in the collection of the Magistrato dei Pupilli. As for the Giudici di Petizionin Venice, this institution had the aim to certify inheritances. However, while in Venice the Petizion courtrecorded all the inheritances, the Magistrati dei pupillifocused in granting a tutor and the management of the inheritance for the children. Probably for this reason, Florence had consistently less inventories recorded for artisans. Here I was able to gather 206 inventories, of which 85 could be used in the final database. However, despite the lower number of inventories, Florence is precious for all the account books that are preserved there. 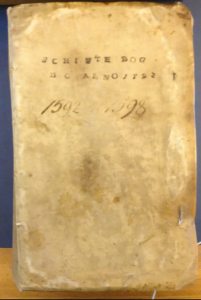 From the medieval to the contemporary age, it is possible to find almost any type of account book produced by traders, artisans, hospitals and other institutions at the State Archive. In our case, I was able to find a few account books that will help us better analyze and understand the data from the inventories. These books are usually journals written by peddlers, shoemakers and mercers, and they record all the transactions made in their shops or stands. The account books from Florence. The final stage of the research was carried out in Siena. For this city, I could profit from the experience of Paula Hohti. 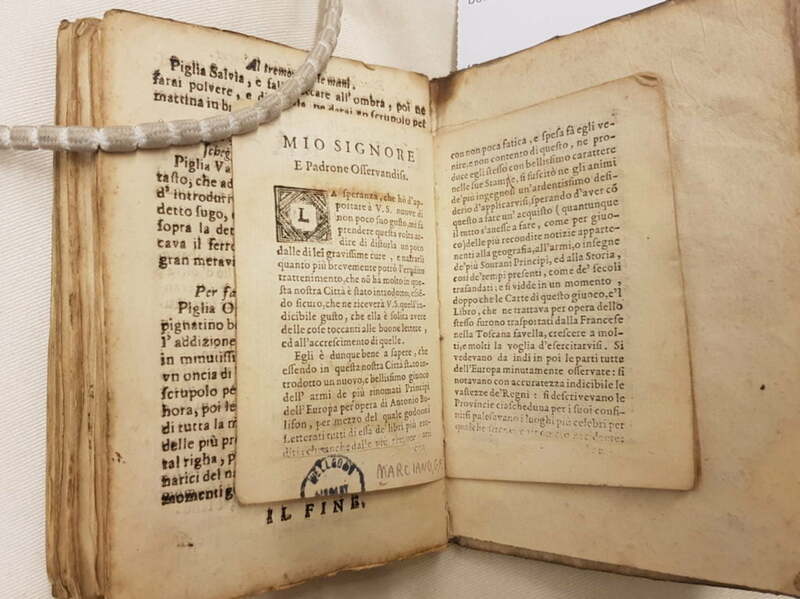 Part of the material for the 16thcentury had indeed already been identified by Paula, and my work here consisted of continuing the analysis of the collection, the Curia del Placito. The Curiain Siena had the same role as the Magistrato dei Pupilliin Florence. 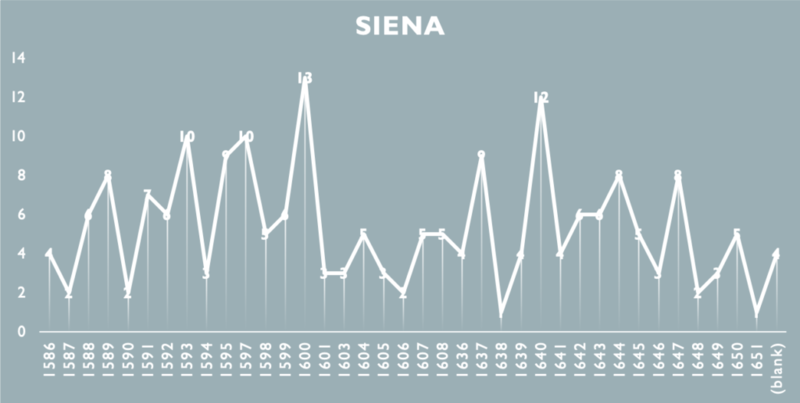 However, Siena was more fruitful from the point of view of the artisan’s inventories, since we were able to gather 203 inventories of which 185 were used for the database. 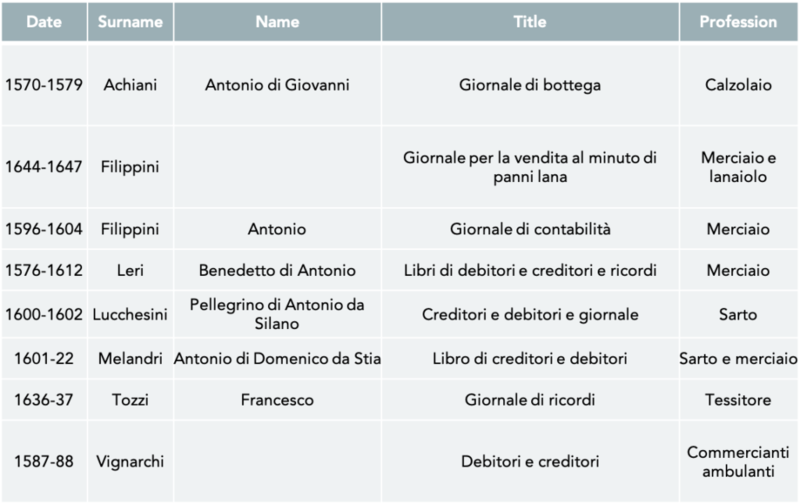 To these, it is possible to add the auction records of the cases where the Sienese government had authorized the tutor to liquidize some of the assets of their underage protégés. These lists of goods—despite being very often partial—are particularly useful in understanding the value of items, since they report the selling price, as well the items that were chosen for being sold, thus considered as a reserve of value. A page from the auction records of Bartolo macellaio from Siena (ASSi, Curia del Placito, Vendite di immobili dei pupilli, reg. 1334, c. 1r, 10 January 1630). As it is possible to see from Chart 1, the distribution of the inventories is not equal, and this is of course due to the typology of the collections, to the role of the institutions that recorded the inventories, and to the population and size that characterized the cities, all of which will be considered when comparing them. Not equal is also the temporal distribution of the artisan’s inventories, which are of course linked to health issues among the population, as well as to local events or to problems related to the preservation of the documents. (see Charts 2, 3 and 4). Temporal distribution of artisan’s inventories. After this first phase of archival research, it is time now to implement the database! 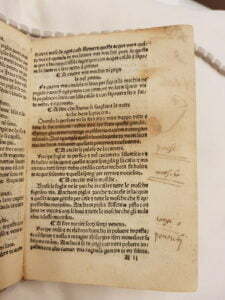 The inventories from Siena and Florence have been already transcribed, but Venice is still an open field. So…let’s get out the reading glasses and make sure that by next spring also the inventories from the Serenissima will be fully transcribed. Stay tuned!